Dimensions 1.25 by 6 by 9 in. Amazon.com description: Product Description: This book provides practical guidance on what remains the single most important statutory basis for police duties and powers in England and Wales, the Police and Criminal Evidence Act 1984 and its Codes of Practice. The second edition has been fully updated and includes revised and expanded case studies and diagrams. There is further information dealing with the application of the Act for those outside the police charged with investigating offences, such as Revenue and Customs, the Armed Forces, security officers and Community Support Officers. Amendments to the Codes of Practice, including Code A (December 2008), Codes B, C and D (January 2008), and Codes E and F (April 2010), are also included. With the aid of check-lists, flow-charts and illustrative examples, this book gives excellent guidance on how the procedures and requirements of the Act apply to common every day scenarios facing police officers, as well as other persons charged with the investigation of offences. The appendices contain the full text of the Act, in addition to the latest version of the Codes of Practice. This is an essential reference source which the busy police officer or legal practitioner cannot afford to be without. About: Providing practical guidance on what remains the single most important statutory basis for police duties and powers in England and Wales - the Police and Criminal Evidence Act 1984 and its Codes of Practice - this is an essential reference source which the busy police officer or legal practitioner cannot afford to be without. 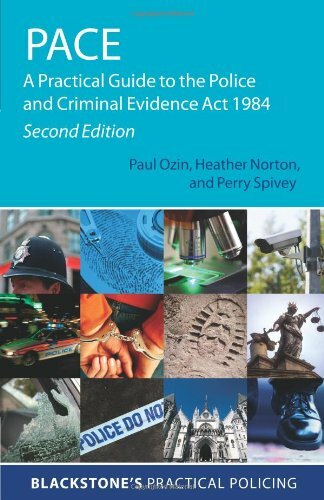 About: This book provides practical guidance on what remains the single most important statutory basis for police duties and powers in England and Wales, the Police and Criminal Evidence Act 1984 and its Codes of Practice.